Since the Fed interest rate cut in September, the stock markets across much of the world took the cue to let rip with strong bullish rallies. The trigger for the rally is a switch in market perceptions from interest rate rises to interest rate cuts. The market is therefore pricing in more interest rate cuts AND lower inflation. Whilst many may argue that with crude oil nudging along at $80 and many other commodities at multi-decade highs, that inflation is far from dead. Well frankly, as we have seen it does not matter if they are right or wrong in the longer term where inflation is concerned. As the market is only interested in the switch of future interest rate perceptions as the primary indicator for future inflation, and NOT inflation forecasts. This in addition to the clear fact that the worlds central banks will always come to the rescue of the markets at times of tight liquidity, which ensured that the rally's we have witnessed were inevitable. I alluded to as much in conclusion to the article of 31st July 2007 - Hedge Fund Subprime Credit Crunch to Impact Interest Rates - "Therefore it is highly likely we are very near an interest rate peak of some significance. I expect the USA to be the first to cut interest rates, followed by the UK and then the European Central Bank. This is pretty much contrary to current market consensus and therefore an opportunity exists for those of a similar opinion to make decisions ahead of the curve as the market realise's the bullish implications of much lower interest rates". Now, whilst I have always acknowledged reactions against the trend as corrective in an ongoing bull market. As have already weathered the crash in the financial sector, and given recent market announcements, the market is clearly saying that now bad news is good news. That does not mean that further sharp falls or what we could term as crashettes are not on the cards, which would be good buying opportunities. So how could the stock market in such euphoric mood have a crashette ? Easy, Higher interest rate fears hit the market on the back of say bad inflation figures. That would spark a sell off until the Fed and other central banks stepped in with soothing words and extra liquidity and signal for lower interest rates. Likely such sell offs would occur after a sustained bull rally, and thus be corrections within the bull trend. Technicians don't need a reason, they can see an overbought condition on the charts a mile away, but many market commentators need a reason to say why the market is rising or falling sharply etc. Yes we had the non farm payroll roll figures, but they just confirm what the market already knew as evidenced by the strong up trend in the price charts. Clearly the market has priced in the ALL of the BAD NEWS that the credit crunch or housing market is likely to deliver. Despite talk of a US recession, the market is saying so what if there's a recession ? We have already priced in lower growth. A Market that rallies strongly on bad news or anticipated bad news is not one to bet against ! As when the bad news hits its going to be taken as a further reason to buy. Its early October and stocks should be falling, but they are not! It increasingly looks like the August sell off and gyrations were the main correction. We could still have a significant plunge this month, let me rephrase that. 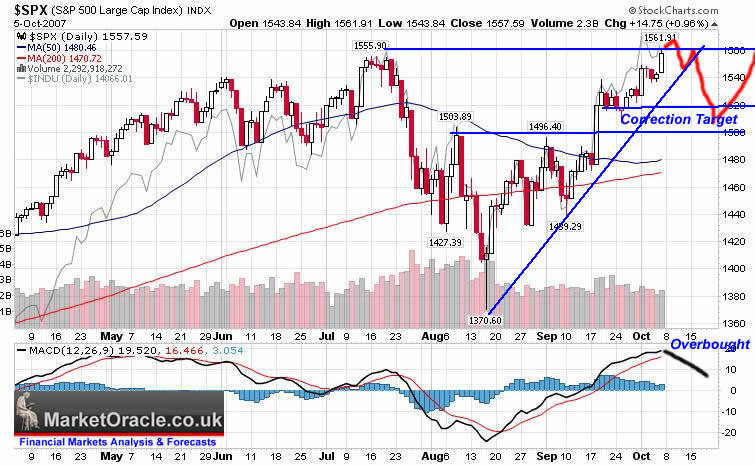 We SHOULD still have significant sell off this month to prime the market for the end of year rally. But time is running out as we move into the seasonally strongest period of the year for stocks. It can be hard measuring the magnitude of a correction before it has even begun, but I do not now expect one of any real significance, i.e. definitely not one that would revisit the September lows, let alone the swing lows made in August. The next two to three weeks should be weak, with a downward corrective bias as illustrated below. A good gauge of market strength or weakness is to consider the markets performance against a forecast. I.e. if the forecast is for weakness and the market shows strength then that is an extremely bullish signal. On the other hand if the market is much weaker than expected then that conversely is a much bearish signal. Therefore if the market continues its rally through anticipated seasonal weakness this month, then that just confirms the view how strong this bull market is, and that it has much longer to run ! many years infact. In Conclusion - I would view any future sell offs as buying opportunities, this bull market is behaving as though it has just begun rather than having run for over 5 years! It may remind some of pre 1987, but to me it looks more like pre 1995. But do expect volatility in this Jackal and Hyde BULL market as the market moves between rate rising and cutting expectations within an overall up trending stocks bull market. My favorite sectors were mentioned in the article of 22nd August 07 UK Housing Market Crash of 2007 - 2008 and Steps to Protect Your Wealth , of which only the oil majors are so far failing to perform which implies lower oil prices.My only regret is that I had not bought more during the recent sell off. (c) 2005-07 Marketoracle.co.uk (Market Oracle Ltd). All rights reserved.